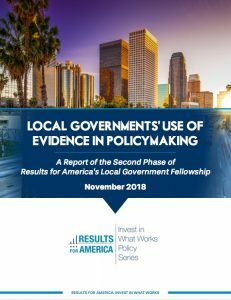 Between March 2016 and December 2018, Results for America implemented the second phase of its Local Government Fellowship, bringing together a national network of senior leaders from 16 local government jurisdictions and helping these leaders achieve evidence-based policy “wins” within their city and county halls. With the support and guidance of Results for America, the Local Government Fellows led their governments toward advanced stages of data-driven and evidence-based policymaking to address major policy challenges in their communities. Local governments spend billions of taxpayer dollars each year to ensure the safety and improve the well-being of their citizens. Yet, without a strong and ongoing commitment to 1) evaluate the impact of these investments, and 2) use data and evidence to understand which policies and programs are working and which are not, it is unclear whether public resources are being spent effectively and efficiently. Given constrained public resources and growing needs of urban populations across the nation, local governments must make decisions that are informed by the best evidence and data available. It is against this backdrop that in September 2014, Results for America launched its inaugural Local Government Fellowship program. After important progress and early impacts from this first phase of the Fellowship, the Laura and John Arnold Foundation generously invested in a second phase the Local Government Fellowship, which Results for America launched in June 2016 with 15 Local Government Fellows. Beginning in 2017, the George Kaiser Family Foundation generously supported an additional fellow from Tulsa city government to join the program. In the second phase, Results for America increased the size of the cohort from 11 to 16 jurisdictions due to increased demand among local governments to advance their data-driven practices. The enhanced cohort created a larger group of champions seeking to enhance the effectiveness of their governments through evidence-based policymaking. The 16 Fellows represent a diverse cross-section of local government, including: Albuquerque, Atlanta, Baltimore, Cook County (IL), Dallas, King County (WA), Los Angeles, Louisville, Montgomery County (MD), New Orleans, New York City, Philadelphia, Salt Lake County (UT), Seattle, Tulsa, and Washington, D.C. These jurisdictions collectively represent more than 29 million people (nearly 9 percent of the U.S. population) and $143 billion in annual local government spending. By enhancing municipal leadership and supporting individual examples of change in these 16 jurisdictions, the Local Government Fellowship program advances local public investment in results-driven solutions in order to improve outcomes for youth, families, and their communities.